..you get that email that tells you one of your images has been chosen or shortlisted for one thing or another. It’s not what we set out to do as photographers. The images we take are all that matters but when those images are recognised and validated by judges of competitions, it feels good. I heard this afternoon that one of my images, that shown below, has been shortlisted for the Royal Photographic Society membership card competition. There are some great images in the shortlist but if you like my photograph, well, your vote would be much appreciated. You don’t have to be a member of the Royal Photographic Society to do this. Simply follow this link and leave your email address. You won’t be spammed I promise..
Here’s my image. Taken in Iceland last winter. The Wizard’s Hat has become one of those iconic Iceland images. I was very lucky with the weather and the light the day I was there to capture my own take on this iconic landmark. This entry was posted on October 7, 2016 by Chillbrook. It was filed under Photography, Photography and Travel and was tagged with Adrian Theze, Competition, Iceland, Landscape Photography, Photography, Photography Competition, Royal Photographic Society, RPS, Snaefellsness Peninsular. Congratulations!!! It’s a beautiful out of this world image. You totally deserve the nomination! Beautiful shots Adrian ~ and so worthy of recognition. Your work in Iceland has been outstanding and great to see it getting noticed. Congratulations! Not surprising, it is a beauty. Magical shot and a wondrous sight ChillB . 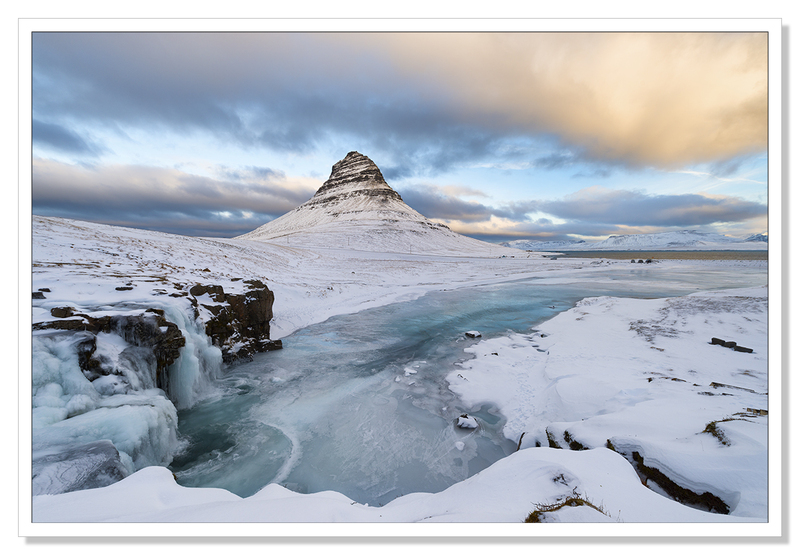 SO many times we see the Wizard’s Hat in a more foreboding light and it can all feel a bit cliche – I’ve a few of those myself lol – but this is rather special … and not a scene many will have encountered unless they too have pushed themselves and been fortunate with Iceland’s fickle weather . Congratulations, dear Adrian! This is great news once again, we’re very happy for you that your work is being noticed, recognised and so highly appreciated. :-) This is a beautiful capture of the the Wizard’s Hat. This is not a matter of being lucky, you are good. And please keep the good news coming on to us. :-) We’ll follow the link now. Gosh you’re on a roll Adrian. Great image and I’ve voted for you……though as you say there are some other super photos shortlisted too. What’s difficult is that it’s hard to compare the images because of the variety of subjects and genres. So I suspect the votes will be cast quite widely. What’s good is that your image stands up against the best of them. Never mind, as you say great to get shortlisted. That’s wonderful Adrian. Congratulations. I entered my email address in the comments. I hope that’s what I was supposed to do. Wonderful capture as always Adrian. Good luck with the competition!! You got my vote! It’s a great photo. Iceland is now in my travel sights solely down to seeing your Iceland photos over the last few months. Thanks for the inspirartion. It’s a mountain that has some similarities with the Matterhorn – both stand aloof and un-crowded by other peaks. and both have a pyramidal shape. Both those factors contribute to the intrinsic drama in a peak like this. And the foreground is a tremendous lead-in. Congrats on the short-listing, Adrian. I have cast my vote. That’s a beautiful photo which deserves the recognition. Congratulations and good luck with the rest of the competition. I bet it’s been a chock. As for being away from Internet, it always surprises my how easy it is, when there is no choice, and equally how hard it is to stay away when Internet is available. I hope you had a great couple of weeks in Fuerteventura, Adrian. Wow this is exquisite, Adrian, such amazing soft colors! Hope all is well, greetz, Ron. All great here, thanks! Looking forward to photos from your trip!